FIGURE 25.6 The measured relative dielectric constant and the soil water content compared to different calibration models. where e is the bulk permittivity of a soil-water-air system (assuming that the permittivity of air equals one), ew and es are the permittivities of water (81 at 20°) and soil particles (assumed as 5), respectively, and n is the soil porosity. It has to be emphasized that the absolute value of water content was estimated from field capacity in spring. Therefore, absolute values may be erroneous to a certain extent, although the measurements of the water content changes as estimated from lysimeter balance readings are accurate. The equation of Topp et al. 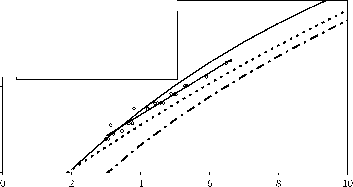 (1980) was found to represent the data best (Figure 25.6). The spatial variations of the soil water content and resulting flux fields were qualitatively investigated using dye tracer tests. Due to the destructive nature of the experiment, the tests had to be conducted at the end of our investigations. The experimental design was chosen according to earlier investigations from Flury et al. (1994): 50 mm of a 4 gl-1 Brilliant Blue (Vitasyn Blau AE85) solution was applied in 4 h. The treated area of 4 m2 was horizontally, layer-wise (20 cm) excavated. Although emphasis was laid on the construction of a homogeneous sand tank, the dye penetrated the substrate irregularly (Figure 25.7). 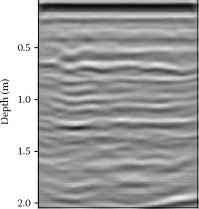 The finger-like flow patterns indicate an heterogeneous flow field with mobile and immobile soil water regions. The dye pattern supported the need to set up a heterogeneous numerical model for comparison purposes. The general suitability of the maximum reflection amplitude as an indicator for the water content variation and thereby of the variability of the hydraulic functions was shown by Schmalz et al. 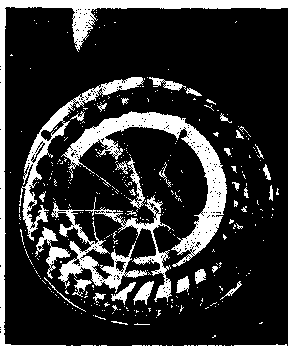 FIGURE 25.7 Stained sand soil profile (top view). The dye pattern indicates a finger-like flow scenario. FIGURE 25.8 Migrated radargrams 3 (a) and 13 h (b) after onset of irrigation (top) and NMRA distribution (bottom) in two depth intervals: 30 to 40 cm (thin line) and 120 to 130 cm (bold line). (2002) in a numerical experiment. In this case, the method was used to evaluate possible soil water content variations in two soil depths (35 and 125 cm) 3 and 13 h after onset of irrigation. The analysis was not meant to directly derive absolute soil water content values but to reveal soil moisture heterogeneities in space. Figure 25.8a and Figure 25.8b show the migrated radargrams (conversion of the travel time axis to distance) and the computed NMRA at two depths over the irrigated transect. Three hours after onset of irrigation, the highest values occurred on the left-hand side of the sand tank, whereas no clear trend can be depicted from the radargram as derived 13 h after the start of irrigation. 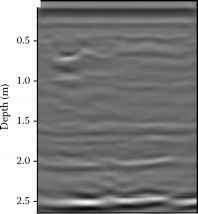 Spatially distributed soil physical parameter measurements indicated nonuniform depth-dependent retention characteristics. Optimized van Genuchten parameter values revealed a variation of the saturated water content, 8s, from 0.27 to 0.36, and the residual water content, 8r, was found to be 0 in all cases. The range of observed soil hydraulic functions was used to generate layered and heterogeneous flux fields assuming no spatial autocorrelation for any parameter within one soil layer because no spatial autodependency could be observed from spatial highly resolved bulk density measurements. Next to a layer-wise consideration of soil physical properties, we set up a numerical model in which the independently determined hydraulic properties were randomly distributed over the numerical mesh holding 4488 nodes. In Figure 25.9 and Figure 25.10 we present the variations of the soil water content over the entire soil profile and within two selected soil layers. Only in the heterogeneous case could significant volumetric moisture variations of 0.15 cm3 cm-3 be observed. In a next step the soil water content values along with the NMRA signals of two selected soil depths were statistically analyzed and box plots of the distributions were computed (Figure 25.11). It is obvious that there are similarities in the general appearance of the statistical distributions only between the water content variations and the NMRA distribution assuming a heterogeneous distribution of the soil hydraulic properties (middle graphs in Figure 25.11). When a layer-wise orientation of the soil physical properties is considered in the soil water status simulations (top graphs in Figure 25.11), the resulting statistical distribution shows no accordance to the NMRA distribution. Although it is not possible to directly derive absolute soil water content values from the NMRA signal, its statistical distribution might be helpful in generating heterogeneous flux fields.